don’t touch the owie, originally uploaded by hobbsandbean. I’ll try to get an updated picture of this tomorrow, since now he is sporting a great eyeshadow-looking bruise along with the nasty scab. This owie represents one of the things I love about Teresa Weinberg. Most of you probably know at least some of what the Weinberg’s have been through this past week. It’s certainly an understatement to say that it’s been emotionally draining for Teresa as a mother. Anyway, while skh and I were at the annual GBC Elder’s Retreat this week, Cal and Mags (being watched by the kind Vanderbekens – more on that later) got to visit the Weinbergs at the hospital. Teresa, in the midst of this ridiculously difficult week, poured tremendous energy into playing with my kids as they visited, including a wild game of Mrs.-Teresa’s-leg-is-a-horse with Calvin. Apparently her leg is a bucking bronco, because Cal ended up connecting his eye with the floor. Teresa of course felt terribly about this, but I don’t at all. The hospitality of the Weinberg family is legendary, but to see this spiritual gift displayed in the hospital where their son was recovering from being dead only a few short days before…well, it’s pretty amazing. 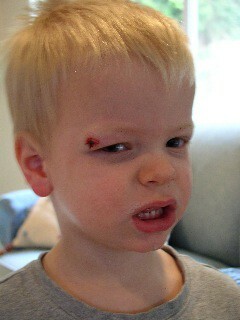 God IS good, and I’m thankful for the scabby reminder above our son’s eye. Remind Calvin that real men think owies are cool. this just makes us want more…..and more…..postings and pictures. kiss the baby boy for me and his bop. and micah – just think what a cool scar he’ll have!